Doug Marshall tested positive for a banned substance following his Bellator 109 bout against Alexander Shlemenko last month and has been suspended by the Pennsylvania State Athletic Commission. Pennsylvania State Athletic Commission Executive Director Gregory Sirb confirmed the positive drug test and suspension with TheMMAReport.com on Monday. While Sirb confirmed the positive drug test result, he could not state what substance caused the positive test. Marshall has received a suspension, but Sirb did not state how long the suspension will be for. According to the Pennsylvania State Athletic Commission website, the commission currently test for Amphetamines, Barbiturates, Benzodiazepines, Cocaine, Marijuana, Methadone, Methaqualone, Opiates, Steroids, Growth Hormones (HGH), Phencyclidine, Propoxyphene and Ephedra. Marshall was initially scheduled to meet Shlemenko at Bellator 98 in September, but ended up pulling out of the fight with an injury. Prior to pulling out of the fight, the Mohegan Tribe commission had granted Marshall a TUE for TRT according to Mohegan Tribe Director Mike Mazzulli. Bellator MMA Chairman and CEO Bjorn Rebney issued a statement on Monday to TheMMAReport.com about the suspension of the middleweight fighter. Marshall becomes the second known fighter to test positive for a banned substance at a Bellator event. 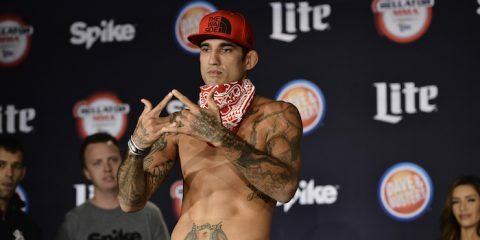 Steven Marrocco of MMAJunkie.com reported earlier this year that Steven Artoff tested positive for marijuana at Bellator 96 in June. Since the beginning of season eight at the beginning of this year, TheMMAReport.com has been able to confirm with commission contacts that drug testing has taken place at 12 of the 25 events that Bellator held in 2013. During the recently completed season nine of Bellator, drug testing took place at seven of the events. In the other five events, the regulating commission would not confirm or deny whether drug testing took place.